But he had to commission another one . . . here’s why. I commissioned Steve in July of 2009 to make me a Tennant Coat, the details of which can be found in another review I wrote which appears on his blog. 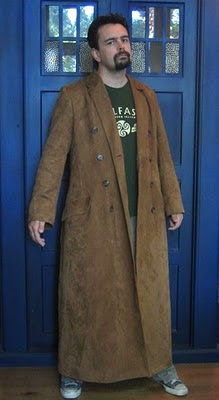 Needless to say, that particular coat exceeded my expectations, as did Steve's customer service. Often when you’re parting with wads of cash to enter into some mail order type transaction, the potential for disaster can be quite considerable. And, often, your fears are fairly well-founded, like when you order the Dark Knight cape and cowl, so you can sweep through the icy night, gazing at the glittering city below from atop churches, your night-black cape whipping against the stars... and you get something made of party hat plastic with a hair-thin piece of elastic stapled to it to keep it precariously perched on your nose. 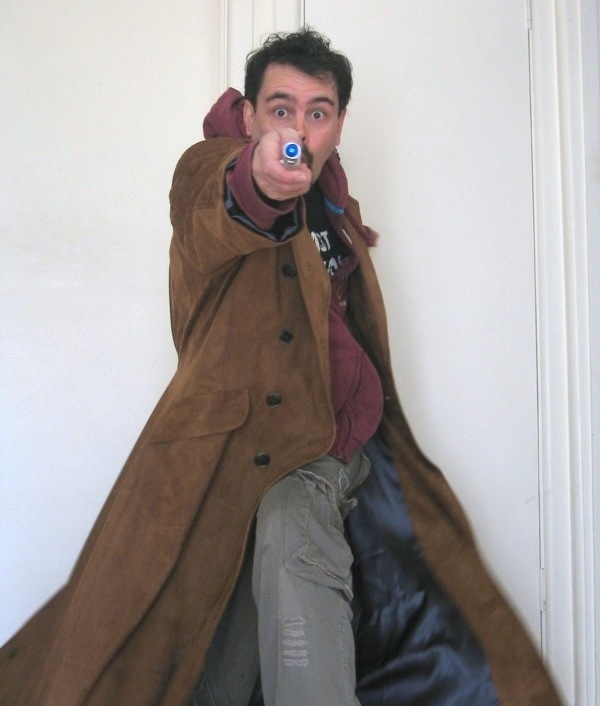 As many of you who read my initial review of my first Steve Ricks Tennant coat can attest, this certainly wasn’t the case with that particular garment. There was, however, one tiny issue with the coat, which many people would have been happy to overlook, or possibly not have even noticed at all. But to a psychotic perfectionist like myself, it was an insurmountable problem. The hem was about three inches too short. 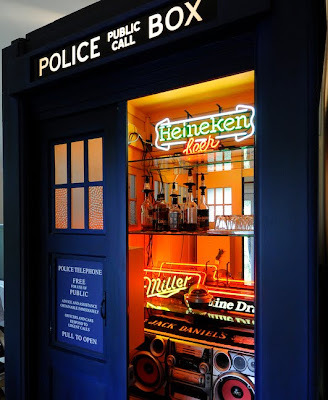 (cue dramatic musical sting ... Da-da-da ... DUUUUUUUUMMMM!!!) I know, I know, who cares, right? To me, one of the primary features of this coat is the very fact that it's ankle length, which is a rarity in any off-the-rack coat. And three inches makes all the difference (I never believed my partner when she said that, until now). I should reiterate though, that this had nothing whatsoever to do with Steve, his skill as a tailor, or his communication. It was squarely on my shoulders, as I had miscalculated the length of the hem. By THREE INCHES!!! I had supplied Steve with the numbers, and he had cut the coat to exactly what I had asked for. At first I tried to shrug it off. It’s only three inches or so, who’s going to notice that? It doesn’t even matter, nobody will ever know, you’ll forget about it in no time. But I noticed, it DID matter, EVERYBODY knew because I couldn't help pointing it out to them, and I DIDN’T forget about it. It was as though somebody pointed out to you that one of the diciples in Leonardo Da Vinci's The Last Supper was wearing a Doobie Brothers T-Shirt. You're never going to be able to look at that masterpiece again without instantly seeing that anachronism. I think the deciding moment came when I was browsing around an antique barn in the coat, and there was a full-length mirror leaning against a wall, highlighting in big-screen technicolour, the lower half of my body. And my Chuck Taylors, and, like some 18th century jezzabelle, far too much of my lower leg, were on show. I knew at that moment that the only way to restore order to my ransacked insurance office of a mind, was to re-commission Steve. Steve was mortified when he discovered I wasn’t one hundred percent happy with one of his coats, even though the mistake had been my doing. He sent me detailed pictures and descriptions of how the hem was constructed, outlining that the unique fashion in which the corners were made made letting the hem out a few inches impossible. Like a man being handed the money found in his dead mother’s pocket by the cops, he almost mournfully accepted the commission, heavy with appreciation for my predicament. 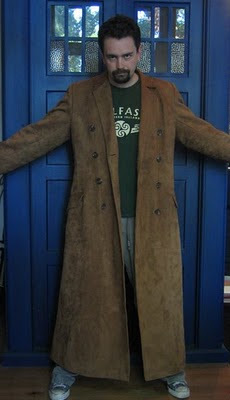 To offset part of the price of my stupidity, I advertised my original coat on one of the Doctor Who forums for sale. Almost before I’d even clicked “Submit”, the coat had virtually sprinted out the door on it’s own. It now lives in Kentucky, USA, and it's new owner is a very, very happy man. 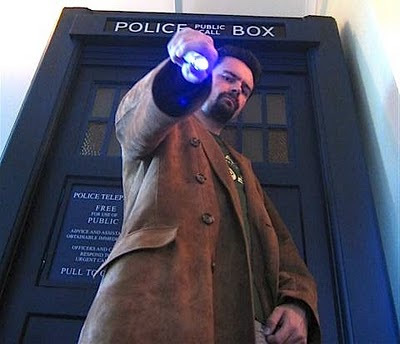 As I am possibly the only person in the world lucky enough to have owned two Steve Ricks tennant Coats, I was in the unique position of having examined the first one enough to request a few small tweaks to it's design. Very minor customisations to make the second coat even better suited to the obsessive prefectionist that is me. In addition to the hem length being generously lengthened, I asked for the sleeves to be an inch longer (the originals were perfectly acceptable, I just always prefer the extra length in my sleeves), The side pockets to be made the tiniest fraction wider (my ham-fisted soup bones were just squeaking through on the first one), the back to be a little more fitted (purely a personal choice of my own), and for the side pockets to be moved further down the body of the coat, to be positioned between the two lowest buttons. This last point probably caused Steve the largest of his many Ian-related headaches, as I believe he had to tamper with the pattern somewhat to achieve this. Nevertheless, he took care of each and every pedantic point with his usual good humour and Cyber-like precision. And so, a second agonising wait began. 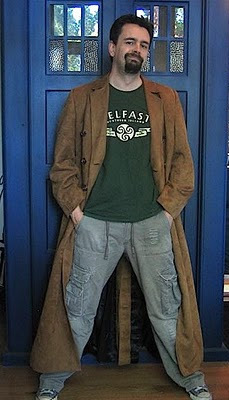 I had been in possession of my Tennant coat for less than one week, and now I had to wait for my second. It was like that scene in the Curse of Fatal Death, where the Master falls into the sewer and spends eighty million years down there or something, then finally gets out, all limping and drenched in crap, only to fall straight back in. But finally, the day dawned, and another Fed-Ex box appeared on my kitchen table, and my partner made a few more wisecracks about my squealing. And a few semi-serious queries relating to my age and gender. I dismembered that box like it was my most loathed nemesis, and the glorious folds of malabar unfurled in our kitchen, sweeping into a mighty brown arc as I instantly slipped into it. 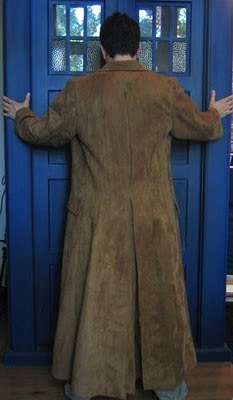 Of course, the coat arrived on day one of the hottest week for this time of year in Australia since 1925. The temperature was hovering around the high thirties, so perhaps an ankle-length suede overcoat may not be the most prudent choice for the climate, but I still swirled and span and pirrouetted like some type of questionable idiot for several minutes. The new coat is, naturally, almost identical to it’s predecessor in appearance, aside from the small alterations I asked to be incorporated into it’s design. At 58 inches, it may even be a tad long, which is profoundly okay with me. Due to the oncoming brutality of the Australian summer, I haven’t yet had a chance to field test the coat, and I'm sure ascending stairs will be challenging, to say the least. Should there be a problem however, I can always have the hem taken up locally. But for now, it’s just fine the way it is, thank you. And when it came to the new sleeves, he even made them so there was a few extra inches of material within the cuff, so I could play with the length later, if I needed to. Which I don't. The lining is slightly different to my first one. In his never-ending search for perfection, Steve has found a material which is even closer to the original. An almost inperceptible difference to mortals like you and I. Also, as readers of his blog will know, he has apparantly been attending tailoring college (“Now then, Mr Hendrix, this is what's known as a “plectrum”.”) and applied some of his new-found expertise to the collar and lapels of this coat. Again, not something any layman would notice. It goes without saying that I am extremely happy with my new coat in all it's aspects. It is a testament to Steve’s professionalism and skill, and my confidence in him, that I commissioned him a second time, at no small financial investment of my own. There was never any question about the end result of Steve’s work when it came to forking out that second deposit. I didn’t even hesitate in that regard. 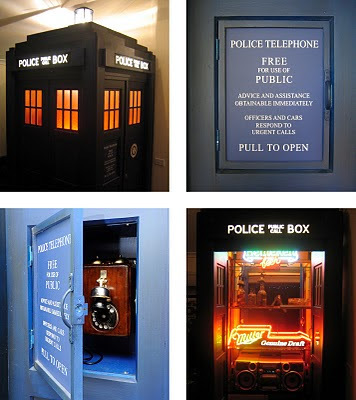 And there’s even a third commission in the works (although not a Tennant Coat this time). In the humble opinion of this very satisfied customer, and speaking as one who has definately tried other avenues when it comes to this type of product, Steven Ricks is the absolute final word in quality, accuracy, professionalism, and service. 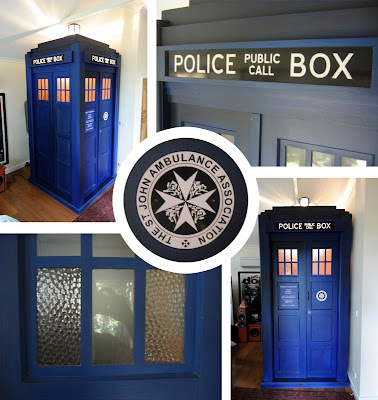 Now, we can’t pass on this review without noting Ian’s stunning self-built Police Box which he has used as a backdrop here. Though Ian likes to think of it as his BARDIS . . .
Another awesome review and that "Bardis" is very cool. Having read the earlier review and the issue of it coming up short...seems I had read somewhere that the original (or one of them at least) was actually cut shorter and then lenght added back on seperately? I'm not saying thats preferable just was thinking I read that somewhere...maybe even here? Thought that I would read from you again ;-) Nice work, that new coat does look great! And that BARDIS is just awesome!